I am currently focused like a blast of grapeshot on SaSS:R, but I wanted to comment on something else I have been doing when I am too tired to write–strategy games! No, not EUIV (though, when the new patch came out that was my go-to after-work de-stressing tool for a few days.) Instead: Into the Breach and Scythe! Both are mech games, because both of my major projects are mech games (despite me being a fairly casual mech fan), and I thought they would be thematically appropriate and keep me thinking along the right lines even as I did other things. Into the Breach and Scythe are very different games, and the latter I am still undecided on. The former (I’m going to call it ItB) has atrocious world-building–probably intentionally so–but intuitive and easy-to-learn controls. 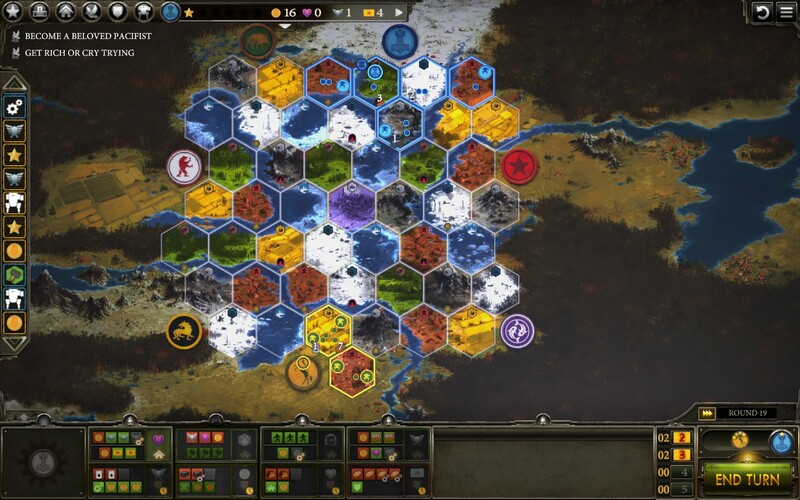 Scythe, on the other hand has great world-building behind it, is inspired by the same artwork that sparked me to work on SaSS:R, but has what feels like (to me) a much steeper learning curve. Neither of them are bad approaches to game-making (though really, if ItB’s world-building is intentionally bad, it isn’t something I appreciate in a game, although it works fine in the late Terry Patchett’s novels), but they create very different end products, and I can’t decide which I like better. Into the Breach is about time travelling mecha pilots, saving the various timelines of the multiverse from the giant Vek (alien bugs the size of mountains.) The art style is very reminiscent for me of the old Advance Wars games (which I loved as a kid and continue to feel affection for in spite of the awful lack of choices in later Campaign missions), and I think it has lots of call-outs to old anime and games (most of which fly right over my head, but I catch a few of them.) The gameplay is solid, the choices are difficult and feel weighty because your score is the number of lives you’ve successfully saved on all of your missions in a given timeline, and the finale is challenging. If only the writing and world-building was as good, I’d have no problem adding it to my Favorites category on Steam. 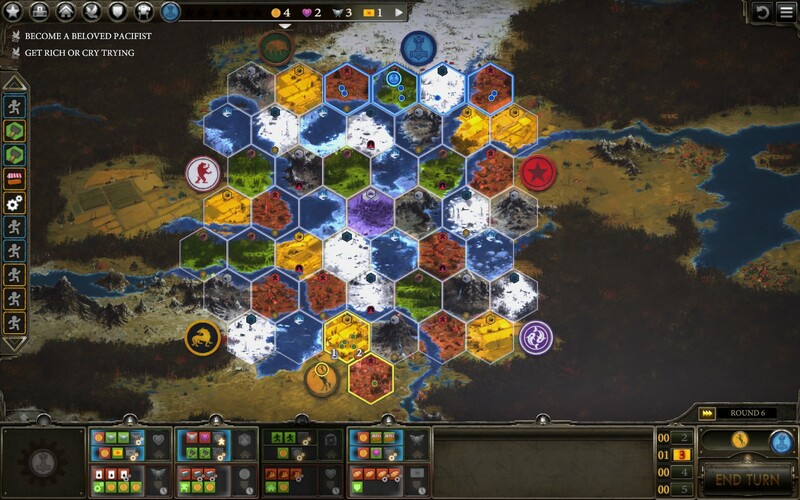 Scythe is a video game version of a board game by the same name, and while it doesn’t have the slick UI or the intuitive play mechanics of ItB, it has world-building worth paying attention to, and deeper mechanics. And it has no randomness–I cannot say how nice a change that is. I like randomness in some games, but at times it can get tedious having it in every game. 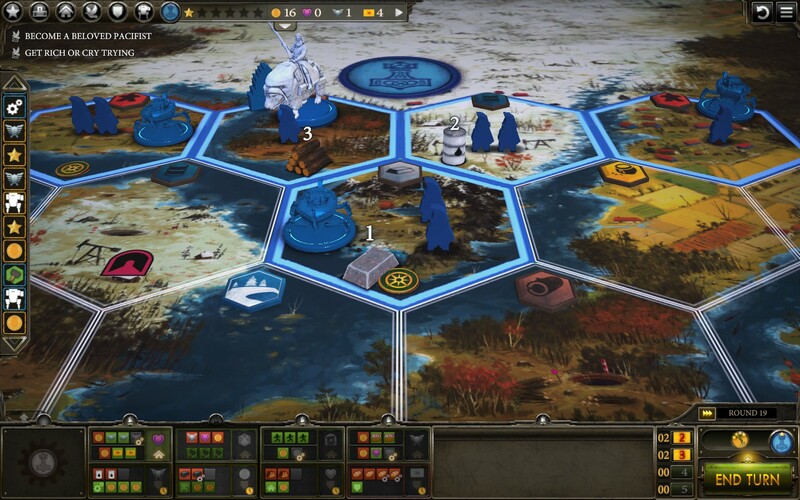 In Scythe, you play as a nation in Eastern “Europa”, after a war of diesel mechs and bear-riding cavalry has shattered the world powers, leaving your people to pick up the pieces in your own little corner of the continent. It is complicated, and I’m still deciding how much I like the gameplay in single player (against bots), but it is certainly the more interesting of the two. I’m growing to enjoy it, but it isn’t a game that instantly commands affection (though if it weren’t for my history with Advance Wars, I don’t think Into the Breach would either.) I think both are worth consideration, though I wouldn’t wholeheartedly recommend either.